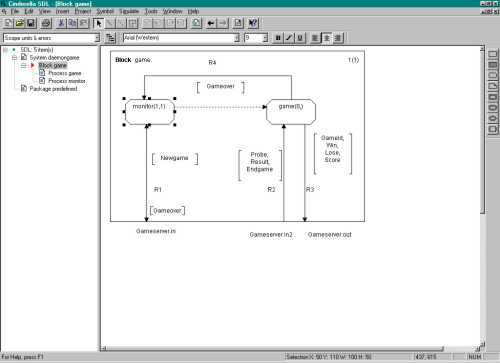 Cinderella SDL is a visual modeling tool for developing embedded software systems, communications services, protocols, or any kind of message/signal based system. Analysis and simulations of your SDL designs. The Integrated Graphical SDL Editor, Analyser, and Simulator fully support the specification language SDL. SDL is a general-purpose object oriented language especially suited for specifying embedded systems and protocols. The Cinderella Incremental SDL Analyser is the most advanced SDL analyser on the market today. The analyser works in the background while you are developing the specification. It even provides automatic error correction for certain types of errors. The Specification Explorer is a versatile user configurable and extremely powerful tool for browsing and editing a specification. The built-in simulator simulates the specification immediately, i.e. no compilation to an executable file is necessary to simulate a specification. You can even simulate partial specifications and update the specification while simulating. Cinderella SDL supports the Common Interchange Format (CIF), an open standard defined by ITU, so it is easy to exchange specifications between different SDL tools. Textual to graphical SDL and reverse converters are included. Text inside a symbol is edited directly in the symbol. Browse and navigate to the definition of an SDL identifier by clicking on its name. A tree view of the specification, the specification explorer. The explorer is used both for browsing and for viewing. 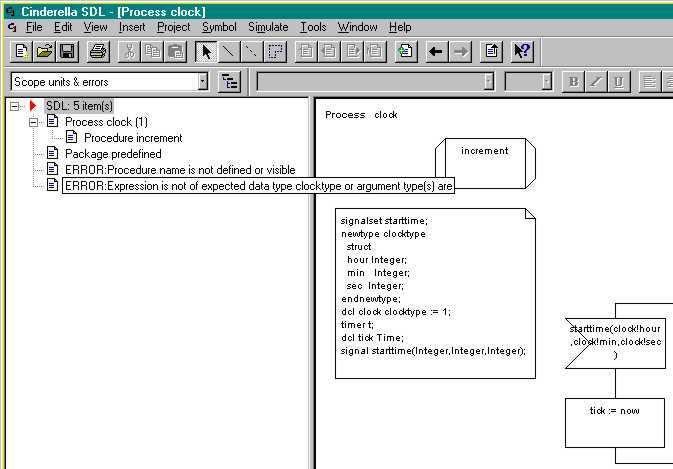 Any kind of specification related information can be viewed in the explorer in as many explorer windows as you like thus having different views of the specification.One explorer can show local properties and/or local errors for the current diagram, another explorer provides an overview of the blocks and processes of the system and a third could show selected dynamic properties such as contents of input queus. Textual SDL can automatically be converted to graphical SDL. The incremental analyser is fully integrated with the editor to provide immediate error detection and optional correction. 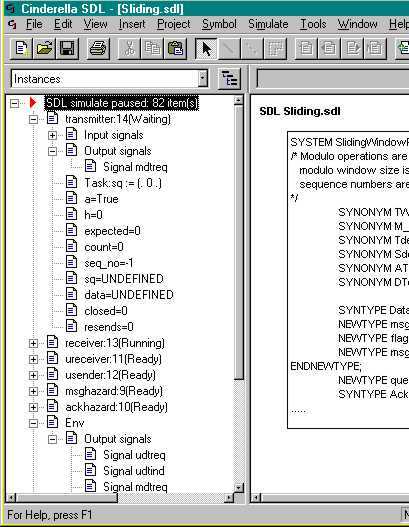 Clicking on an SDL name in a symbol allows to navigate to its definition and to study its properties. Any time during the specification process, you can simulate the behaviour of the parts you have made so far. The simulation e.g. can cover the whole system, parts of the system or a single process. The specification does not need to be complete or free of static errors before simulation can start. Any time during simulation, the output can be inspected on the form of an MSC. The large number of error messages (about 500) enable precise descriptions of errors. If you need more information about a certain error, the F1 button will provide you with details and with examples related to the error. You can also browse to the language help which provide a full description of the syntax of SDL and ASN.1 in the form of hyper-linked syntax diagrams. 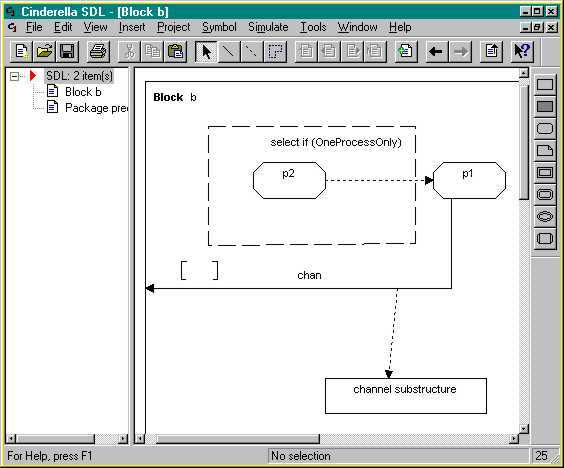 Cinderella SDL, is the first commercial SDL tool with full support for SDL-92, SDL-96 and Z.105. This includes concepts like context parameters, select definitions, channel substructures and integrated use of SDL and ASN.1. and SDL is completely integrated, i.e. you can use ASN.1 as if it was part of the SDL language. Cinderella SDL, supports the ITU Graphical Interchange Format (CIF), allowing specifications to be interchanged between Cinderella SDL, and other commercial tools. The intuitive user interface has all the features you would expect from a Windows 9x//2000/XP program: cut & paste, search & replace, print preview, drag & drop, etc.